ARO & APS vacancies available in this UPPCL recruitment 2017. Out of 80 posts 19 vacancies for Sahayak Samiksha Adhikari and 61 Posts for ARO. Eligible candidates apply online through official website of UPPCL @www.UPPCL.org from 14-December-2017 to 29-December-2017. This Additional Private Secretary, Assistant Review Officers Jobs recruitment of UPPCL will be conducted through written exam in two parts and typing/stenography test on computer. Available vacancies, Important dates such as exam dates, admit available dates, brief details of Typing test, age limits, examination process, post wise qualifications and online application process for this UPPCL Recruitment 2017 of Additional Private Secretary(Sahayak Samiksha Adhikari) Assistant Review Officer (ARO) Jobs are given below. For Additional Private Secretary- Degree qualification and with at least Stenography and typing skills on computer is required. The candidate's age limits as on 01-July-2017 is 21-40 Years. For SC/ST 5 years, For OBC 3 years of upper age relaxations are given. 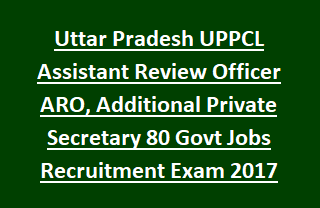 Selection for this UPPCL Assistant Review Officer, Private Secretary Jobs recruitment will be held based on CBT based written test and typing test. For Assistant Review Officer posts written test will conducted for 200 marks. This computer knowledge test marks will not be considered for preparing merit list. UPPCL Part 2-Will be conducted for 200 marks. UPPCL Part 1- 50 Marks of NIELIT "O" Level Computer Knowledge paper for Additional Private Secretary will be given. Candidates must have secured 20 marks in this exam if he/she failed to secure 20 marks Part 2 paper will not be go for correction. Stenography Test: 5 Minutes dictation will be given and candidate should have completed typing in 35 minutes. Typing speed should be 80 wpm in English and 40 wpm in Hindi. For General/OBC candidates exam fee is Rs.900/- and for SC/ST Rs.600 and for PH candidates exam fee is Rs.10/-. The candidates can apply online via the official website of UPPCL @www.uppcl.org only. Before applying online read official notification carefully. Submit the application form online on or before 29-12-2017. Click here to apply online for the UP POWER CORPORATION LTD Additional Private Secretary, Assistant Review Officer Recruitment 2017. Click here to see the official notification of UPPCL Additional Private Secretary (Sahayak Samiksha Adhikari),Assistant Review Officer (ARO) Recruitment. Please share this UPPCL notification with your friends and if you are looking for any job related information feel free to Comment below we will respond you in time.